Last week let us even deeper into the weird and wonderful headspace of Tina, but tonight we find ourselves getting roughed up by the greedy little paws of little Louise. She and her siblings, spending an afternoon combing the beach, stumble across a massive piece of ambergris, a waxy lump excreted by a sperm whale. And as it turns out, it is quite valuable—to the tune of $30,000 for one small piece—but illegal to sell. So, the kids are off on an adventure to try to make their fortune, using the only criminal they know: Mickey, the dude who runs the tilt-a-whirl at the local carnival. 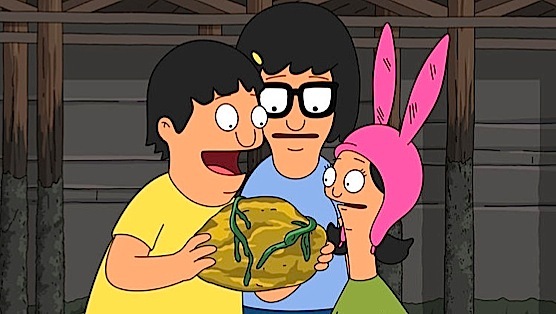 If you’re looking for yet another reason for why Bob’s Burgers is such a rare and special sitcom, look no further than its treatment of the main characters. By this point in any other show, they would have turned each child into a bundle of over-the-top quirks and borderline awful character traits. You’ll get no such issues with Bob’s. There are small notes of character development, but being an animated show, they can keep all five of the Belchers stuck in their individual tracks without concerns of aging. As well, it seems the egos of the folks voicing each one are ao perfectly satisfied with being a part of such a smart and funny show like this one that they aren’t lobbying for more screen time. The writers are also savvy enough to be able to add new wrinkles to the show that don’t feel tacked on or above the pale. Tina’s Equestranauts adventure felt perfect for her, fitting as it does her already well-conceived profile of sexual confusion and hormonal angst. Same goes for Louise. We’ve known from the beginning that she’s much smarter than her age with a conniving streak that would be terrifying if it wasn’t coming from a small child. So, when she tries to cut both of her siblings and Mickey out of the sale of the ambergris to the fried dough man at the carnival, it doesn’t feel like she’s going too far too fast. One expects this from her. The fate of the ambergris allows the rough sketch characteristics of each sibling to take a turn in the spotlight. Gene wants nothing more than to lick or eat this massive marine lump. (“Goodnight, ambergris. I’m going to eat some old cheese, but I’ll be thinking of you.”) And poor Tina wants everyone to do the right thing, be that telling their parents, giving the ambergris to Mickey so he can “go straight,” or throwing the big lump into the hot oil of the fried dough stand. The kids are who they are and that doesn’t look to change anytime soon. The parents have their own little adventure tonight, as their landlord dumps his nebbish brother, Felix (voiced by Zach Galifianakis), on them. The younger sibling is so desperate to show he’s up to the task, he decides to not just fix the restaurant’s plumbing, but redo the entire bathroom. The resulting affair is a wonderful show of nouveau riche hubris, as he seems more concerned with the unveiling party that will involve burlesque dancers and a DJ from Brazil. And when the redesigned bathroom is revealed, it’s a modernist monstrosity—no one can tell which of the black objects in it is the sink and which is the toilet. Galifianikis does a great job playing this whole thing with some of the subtlety he brought to the otherwise unsubtle Due Date. Both plotlines added up to an immensely satisfying episode with some of the most laugh-out-loud moments and lines of the whole season.